Public Protector Thuli Madonsela addresses journalists in Johannesburg, South Africa, June 7, 2016. South Africa’s anti-corruption czar, who threw a spotlight on the $23 million in public funds used to upgrade President Jacob Zuma’s private home, wants to launch another high-level investigation that could land in the president’s lap. This time, Thuli Madonsela has asked for resources to examine the Guptas, a wealthy Indian family known to have close ties to Zuma. On Tuesday, Madonsela told journalists in Johannesburg that she is looking into "whether or not the government of South Africa, and in this particular case the president, unlawfully helped the Gupta family to choose ministers and other occupants of high offices." A top South African official has claimed that members of the Gupta family who are not government officials directly offered him a job as national finance minister. South Africa’s constitution says only the president can appoint ministers. Madonsela’s seven-year term as public protector has been distinguished - or, say her critics, marred - by her persistence in investigating top officials. Her most prominent target has been the president, whom she criticized for the government-funded improvements to his country home near the eastern town of Nkandla. 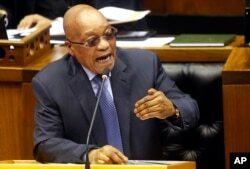 Zuma had argued the upgrades were for national security reasons. FILE - South African President Jacob Zuma answers questions in parliament in Cape Town, South Africa, March 17, 2016. Madonsela’s 2014 investigation, titled “Secure in Comfort,” meticulously debunked the president’s claims that a swimming pool, amphitheater and chicken breeding grounds were necessary for his official security. South Africa’s top court backed Madonsela, and ruled in April that Zuma should pay back some of the money. Zuma's approval ratings have tumbled since the home-improvement scandal broke, and that could hurt his ruling African National Congress party during nationwide municipal elections in August. Madonsela, whose term ends in October, said Tuesday that she does not regret taking the job as anti-corruption czar in 2009. The almost preternaturally calm lawyer and scholar cut an unlikely figure as the South Africa's national watchdog, and her merciless investigations earned her death threats. The Zuma investigation earned Madonsela a spot on Time magazine’s annual list of the most 100 influential people in the world. After October, Madonsela says she plans to take a long sabbatical, eventually returning to teaching and to social activism. Reflecting on her time as public protector, she said her biggest challenge was dealing with politics and politicians. But would she do it again? “I’d say, sign me in,” she said.